China's top legislator voiced hope that North Korea and the United States will implement their nuclear summit agreement as he met with North Korean leader Kim Jong Un, Chinese state media said Monday. 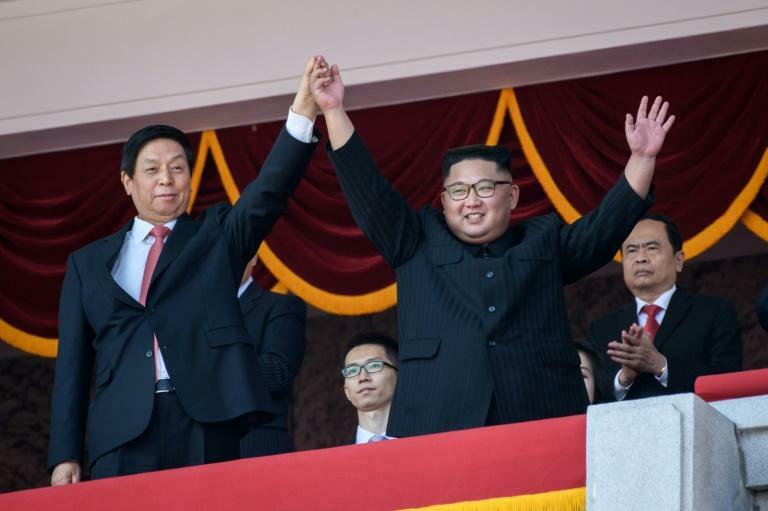 Li Zhanshu, sent by President Xi Jinping to attend North Korea's 70th anniversary parade on Sunday, said China was committed to the goal of denuclearisation of the Korean peninsula, the Xinhua news agency said. "We have high regards of the efforts the DPRK has made towards regional peace and stability," Li was quoted as saying, using the acronym for the North's official name. Xinhua said Li also conveyed his hope that North Korea and the United States could implement the outcome of the June summit between Kim and President Donald Trump in Singapore and work to preserve peaceful talks. Trump and Kim reached a vague agreement to work towards the denuclearisation of the Korean peninsula, but there has been little movement since and Trump has accused Beijing -- North Korea's sole major ally -- of complicating Washington's relationship with Pyongyang. But North Korea refrained from displaying its intercontinental missiles during Sunday's parade, a conspicuous absence that Trump hailed as "a big and very positive statement". For his part, Kim said North Korea adheres to the consensus reached at the summit and "has taken measures in this regard while the US side should take corresponding actions to jointly promote the political settlement of the Korean peninsula issue," according to Xinhua. Li also handed a signed letter from Xi to Kim. In the missive, according to Xinhua, Xi wrote that it "is an unswerving policy of the CPC (Communist Party of China) and the Chinese government to safeguard, consolidate and develop China-DPRK relations". Relations between Pyongyang and Beijing have gone through a rough patch in recent years, with China backing United Nations sanctions to punish its Cold War-era ally for its nuclear activities. But ties have recently improved as Kim met Xi in China three times this year. Although the Chinese leader has yet to return the favour with his own visit to Pyongyang, he sent a major figure in Li to represent him. Li is a member of the Communist Party's seven-person Politburo Standing Committee, China's ruling council.